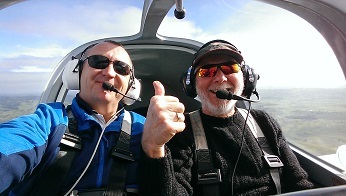 If you have ever dreamed of flying.... it's easy to get started with our “no obligation” introductory trial flights. Take the controls and you fly the plane yourself! No Experience Necessary! Hauraki Aero Club can take you on a trial lesson* in our Tecnam High Performance Microlight aeroplane. We will put you in the pilot's seat with our experienced instructor and let you have control. A great opportunity to judge for yourself whether you are keen to continue with further training or great for a one off experience! You can purchase a gift voucher, an ideal gift for someone wishing to learn to fly. Just contact the Aero Club to find out more. A medical is required before going solo for the first time. Pilots can cancel at anytime and only pay for the flight time accrued. Pilots are encouraged to fly regularly e.g. once a week and must pay for each lesson on the day they fly.